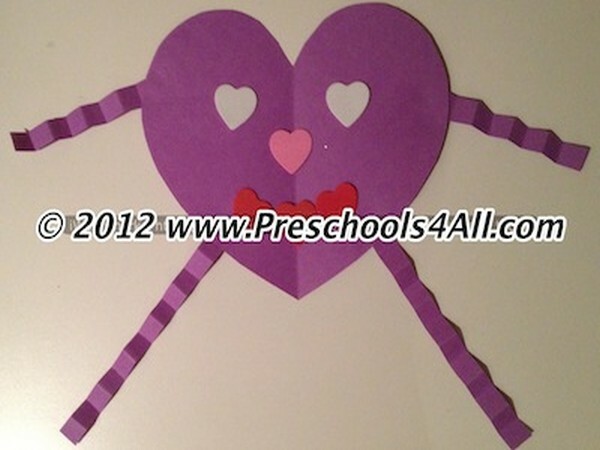 I hope these arts and crafts ideas for Valentines Day will help create wonderful memories with your child. Remember it is the process and NEVER the product or as my good friend likes to say, "There are no mistakes in art." 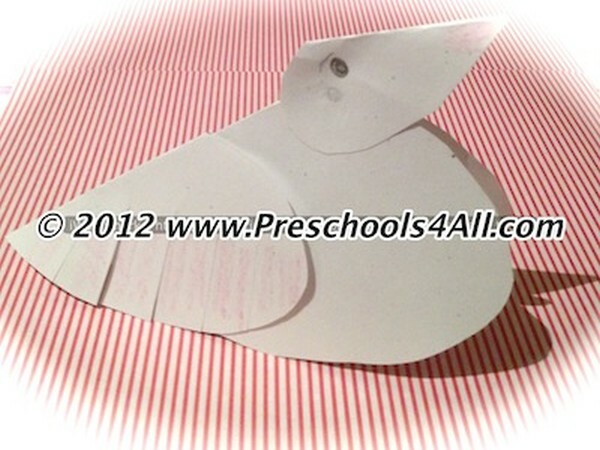 Inspired by the sweet and lovable birds, this art activity is a favorite among children since it is somewhat magical... turning hears into birds. 2. Glue the smallest heart to the largest heart - This is the head. 3. Draw eyes and beak. 4. Cut fringes to the middle heart. 5. Glue the middle heart to the other side of the largest heart. 2. Fold the paper into 1/8. 3. Cut out figures and shapes through all the layers. 4. Unfold and glue on the color paper. 5. Decorate with crayons, sparkles and anything else fancy. This can be a great group project teaching the children that we are all connected. 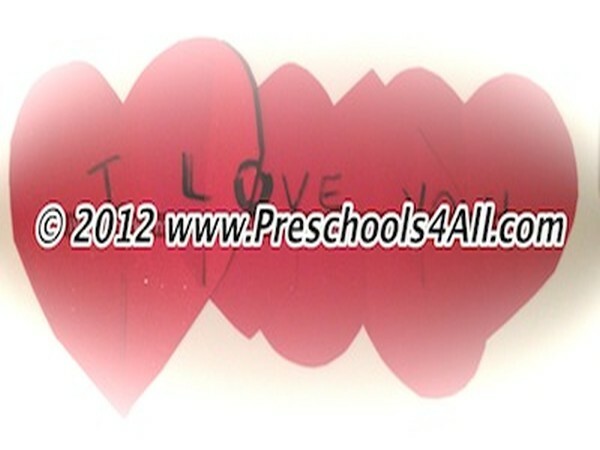 Each child makes their own heart and than they attach it to one another. Some years I have made with the children a large heart person as a mobile and other years a small sized one that we glued magnet on the back of it and it became a fridge magnet. The choice is yours. 1. 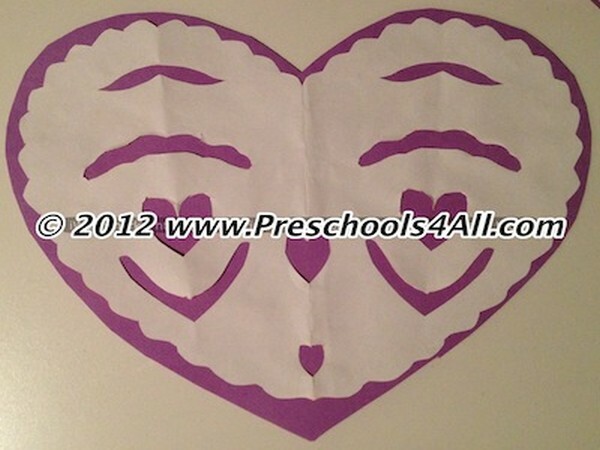 Cut out a heart shape. 2. Cut out strips for legs and arms. 3. Glue eyes, nose, mouth, legs and arms. A great way to capture those little hands. 1. Allow the children to play with the paint and cover their hands with paint. 2. Print their hands on the paper. 3. Glue the squares for the frame. 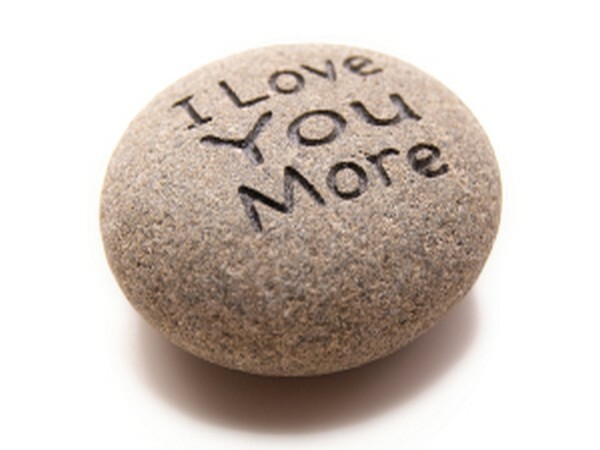 This simple art was inspired by my son who is an avid rock collector.